Human mast cell chymase (HC) and human neutrophil cathepsin G (hCG) show relatively similar cleavage specificities: they both have chymotryptic activity but can also cleave efficiently after leucine. Their relatively broad specificity suggests that they may cleave almost any substrate if present in high enough concentrations or for a sufficiently long time. A number of potential substrates have been identified for these enzymes and, recently, these enzymes have also been implicated in regulating cytokine activity by cleaving numerous cytokines and chemokines. To obtain a better understanding of their selectivity for various potential in vivo substrates, we analyzed the cleavage of a panel of 51 active recombinant cytokines and chemokines. Surprisingly, our results showed a high selectivity of HC; only 4 of 51 of these proteins were substantially cleaved. hCG cleaved a few additional proteins, although this occurred after adding almost equimolar amounts of enzyme to target. The explanation for this wide difference in activity against peptides or other linear substrates compared with native proteins is most likely related to the reduced accessibility of the enzymes to potential cleavage sites in folded proteins. In this article, we present evidence that sites not exposed on the surface of the protein are not cleaved by the enzyme. Interestingly, both enzymes readily cleaved IL-18 and IL-33, two IL-1–related alarmins, as well as the cytokine IL-15, which is important for T cell and NK cell homeostasis. Cleavage of the alarmins by HC and hCG suggests a function in regulating excessive inflammation. Cells of several of the major hematopoietic cell lineages store massive amounts of immune mediators in their cytoplasmic granules. A large fraction of the proteins stored in these granules are serine proteases, and all of these proteases belong to the large family of trypsin/chymotrypsin-related serine proteases (1–4). This protease family also includes many coagulation factors, complement factors, and pancreatic digestive enzymes. The members of this family that are expressed by hematopoietic cells are known as hematopoietic serine proteases. They are primarily found in mast cells (MCs), neutrophils, NK cells, and cytotoxic T cells, where they are stored in their active forms in the granules for rapid release. Very high amounts of these proteases are found in these cells, where the levels can reach 35% of the total cellular protein (5). Human MCs express one chymotryptic enzyme, human MC chymase (HC), one enzyme with tryptic specificity, tryptase, and, in some tissues, an enzyme, human neutrophil cathepsin G (hCG), which is primarily found in neutrophils. hCG is also a chymase, which, in addition to its chymotryptic activity, also has low tryptic activity (6, 7). Neutrophils express four active proteases, N-elastase, proteinase 3, hCG, and neutrophil serine protease 4, as well as one additional enzymatically inactive member of this gene family (1, 4). The last, azurocidin, has potent antibacterial activity; however, as a result of point mutations in two residues of the active site, it has lost its proteolytic activity. The various granule proteins of hematopoietic cells have a number of important immune functions including being antibacterial, antiparasitic, generally inflammatory, or apoptosis inducing. The mouse counterpart of HC, mouse MC protease (mMCP)-4, is very potent at inactivating several snake, bee, and scorpion toxins, indicating an important role in this type of host defense, a function that is likely evolutionarily very old (8). Additionally, two recent studies showed that some of the hematopoietic serine proteases cleave, and thereby inactivate, various cytokines and chemokines. For example, mMCP-4 cleaves and inactivates TNF-α, thereby limiting the inflammatory response (9, 10). HC can also cleave and activate IL-1β and IL-18, as well as cleave the region just outside of the membrane of membrane-bound stem cell factor (SCF), which releases it from the cell (11–13). The release of SCF from the cell surface allows it to move more freely in the tissue, which may be important for attracting progenitor cells, primarily MC progenitors, from the blood. In addition, HC cleaves and inactivates two chemotactic substances: active chemerin and eotaxin-3 (CCL26) (14, 15). mMCP-4 and HC degrade IL-33, an IL-1–related cytokine, thereby potentially playing a role in limiting inflammation (16, 17). Another of the human MC enzymes, tryptase, also efficiently degrades the chemokines eotaxin and RANTES (18). Numerous examples of the role of these enzymes in the degradation of inflammatory mediators were described, indicating that this may be one of the important functions of these enzymes. To study the potential roles of HC and hCG in modulating inflammation by cleaving cytokines and chemokines in more general terms, we present an extensive analysis of the cleavage of 51 human cytokines and chemokines by these two enzymes. The results showed a remarkable selectivity for both enzymes but primarily for HC. Only significant cleavage of 4 of the 51 cytokines and chemokines by HC was observed. hCG cleaved a higher number of targets, apparently as a result of its broader specificity. The cleavage by both enzymes of two IL-1–related cytokines, IL-18 and IL-33, which act as alarmins, indicates a role for these enzymes in limiting excessive inflammation. Recently, HC was shown to activate IL-33 by cleavage in the region between the N-terminal DNA-binding domain and the C-terminal IL-1–related domain (19). To study the competition between the activating and degrading activities of HC on the alarmins IL-18 and IL-33, the proforms of these cytokines were produced as recombinant cytokines, and their cleavage was assessed over time. In this study, we showed that HC, but not hCG, had activating activity on IL-33, which was not present for either protease on IL-18. However, the degrading activity on IL-33 dominated, which contradicts previous studies on the activity of HC on this cytokine, favoring an anti-inflammatory effect by these enzymes. HC was expressed in baculovirus-infected insect cells, purified on heparin-Sepharose as described in Ref. 20 (and references therein). hCG was purified from peripheral blood neutrophils. This enzyme was purchased from BioCentrum (Krakow, Poland). Forty-six recombinant human (rh) cytokines and chemokines were purchased from ImmunoTools (Germany), including rhBAFF/CD257, rhBMP-7, rhCTGF, recombinant human epidermal growth factor (EGF), rhFGF-α/FGF-1, rhFGF-β/FGF-2, rhFlt3L/CD135, rhG-CSF, rhGM-CSF, rhIFN-γ, rhIL-1β, rhIL-2, rhIL-3, rhIL-4, rhIL-5, rhIL-6, rhIL-7, rhIL-8/1-77aa/CXCL8, rhIL-9, rhIL-10, rhIL-11, rhIL-12, rhIL-13, rhIL-15, rhIL-17A, rhIL-17F, rhIL-20, rhIL-21, rhIL-22, rhIL-24, rhIL-31, rhIP-10/CXCL 10, rhLIF, rhMCP1/CCL2, rhMCP2/CCL8, rhMCP3/CCL7, rhPDGF-AA, rhPDGF-BB, rhRANTES/CCL5, rhsCD40L/CD154, rhSCF, rhSDF-1α/CXCL 12a, rhSDF-1β/CXCL 12b, rhTNF-α, rhTSLP, and rhVEGF-A. In addition, rhIL-19 was purchased from R&D Systems (Oxon, U.K.), rhIL-18 was purchased from MBL International (Woburn, MA), and rhIL-33 and rhMIP-1α/CCL3 were purchased from Life Technologies/Invitrogen (Camarillo, CA). The cytokines and chemokines were dissolved in PBS or sterile water, according to the recommendations of the supplier, to get an approximate concentration of 0.13 μg/μl. Subsequently, 9 μl (∼1.2 μg) of the cytokine was mixed with 2 μl of HC (∼30 ng) and hCG (∼300 ng) and incubated for 2.5 h at 37°C. Two microliters of sterile water was used as control. After incubation, the reactions were stopped with the addition of 3 μl of 4× sample buffer. 2-ME (0.5 μl) was added to each sample, followed by heating for 7 min at 85°C. The reaction mixtures were analyzed on 4–12% precast SDS-PAGE gels (Novex; Invitrogen). To visualize the proteins, the gels were stained overnight in colloidal Coomassie staining solution (SERVA Blau G) and destained with 25% (v/v) methanol in double distilled H2O for 4 h (21). The analysis was repeated two times for every cytokine and chemokine. The coding regions for full-length human IL-18 and IL-33 containing an N-terminal 6-histidine purification tag were ordered as designer genes from GenScript (Piscataway, NJ). IL-18 and IL-33 were produced in bacterial cells from the pET21a vector in Escherichia coli Rosetta-gami cells. Both proteins were purified on Ni-chelating IMAC agarose (QIAGEN, Hilden, Germany). After elution with imidazole, the protein concentration was determined by Bradford analysis, confirmed by SDS-PAGE, and adjusted for test cleavage by HC and hCG. The primary amino acid sequences for selected cytokines were downloaded from the National Center for Biotechnology Information protein database and compared with the amino acid sequences of the active recombinant proteins provided by ImmunoTools. The extended cleavage sites for HC and hCG contain ∼8 aa, and cleavage normally occurs after an aromatic amino acid (phenylalanine [F], tyrosine [Y] and tryptophan [W], or leucine [L]) in the P1 substrate position [Schechter and Berger nomenclature, (22)]. Our laboratory identified the consensus cleavable sequence for HC as having F, Y, W, or L in the P1 position and E or D in the P2′ position (23, 24). The primary sequences of the various cytokines and chemokines were analyzed for the presence of such sites or similar sites. To evaluate the accessibility of predicted potential cleavage sites, the cytokines were modeled using the UCSF Chimera program. Structures for the human cytokines IL-4 (2B8U), IL-13 (1GA3), IL-18 (3W02), and IL-33 (2KLL) were downloaded from the RCSB protein data bank (http://www.rcsb.org) and annotated in Adobe Illustrator (CS6). Full-length human IL-18 (20 μg) was incubated at 37°C for 2.5 h with 64 ng of HC. The sample was lyophilized and sent for MALDI–mass spectrometry (MS) analysis (Alphalyse, Odense, Denmark). Following the analysis, the major fragments were matched with tentative fragments based on the position of aromatic amino acids and leucines. The cleavage activity on 50 commercially available active recombinant human cytokines and chemokines by HC and hCG was studied in vitro by cleavage with purified enzymes. Cleavage was performed in PBS at physiological pH in an attempt to mimic the in vivo situation under noninflammatory conditions. To confirm the initial result, a new set of cytokines (a new batch) was acquired, and the experiment was repeated under the same conditions. The results were consistent with the original experiments (data not shown). In both experiments, the enzyme/target ratio was the same: ∼1:40 for HC and 1:4 for hCG. We and other investigators (6) previously observed that hCG is ∼10 times less active than HC under the same cleavage conditions. Most of the 50 cytokines and chemokines were not cleaved by these two enzymes (Fig. 1, Table I). Of the cytokines analyzed, no cleavage or cleavage products was seen for IL-4, IL-5, or IL-10, and HC caused only very minor cleavage of TSLP and IL-13 (Fig. 1, Gel 1). However, for IL-4, the intensity of the band was significantly lower after HC incubation, indicating cleavage. An initial cleavage opening up the structure could subsequently result in complete degradation; therefore, no visible cleavage products would be seen (Fig. 1, Gel 1). Cleavage of SCF, IL-3, GM-CSF, IL-9, and G-CSF was analyzed (Fig. 1, Gel 2). SCF and IL-3 were completely degraded by hCG, but no cleavage was observed with HC, with the exception of a minor N- or C-terminal trimming of IL-3 (Fig. 1, Gel 2). Next, cleavage of IL-2, IFN-γ, IL-15, IL-12, and IL-20 was analyzed. Only IL-15 was found to be a potential target for HC, whereas complete degradation of IL-15 and a minor effect on IL-2 was seen with hCG (Fig. 1, Gel 3). A very minor extra band was also seen in the HC lane for IFN-γ, indicating minor cleavage of this IFN. Cleavage analysis of a panel of 50 recombinant human cytokines and chemokines. Four micrograms of the various recombinant cytokines and chemokines in buffer solution were divided into three tubes. One was kept as negative control (C) to which no enzyme was added, one was cleaved with HC, and one was cleaved with hCG. The cleavage was performed at 37°C for 2.5 h. The samples were separated on 4–12% SDS-PAGE gels under reducing conditions. Size markers are found on the left side of each gel. The gels were stained in colloidal Coomassie blue solution. Cleavage of the inflammatory cytokines IL-1β, TNF-α, IL-6, IL-11, and LIF was also addressed (Fig. 1, Gel 4). 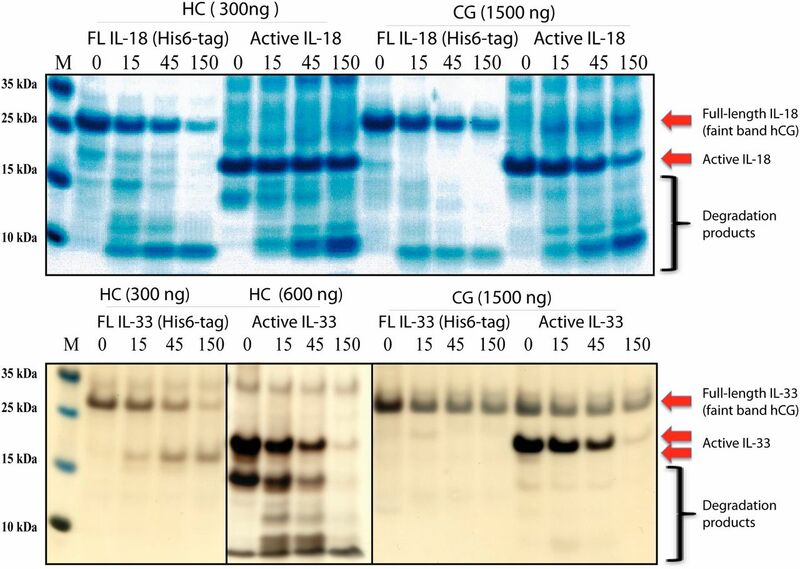 These two enzymes only cleaved IL-6, with hCG being very efficient and HC showing minor activity (Fig. 1, Gel 4). A minor extra band was also seen for TNF-α after cleavage with hCG. Next, cleavage of IL-7, IL-21, IL-24, IL-31, and IL-19 was analyzed (Fig. 1, Gel 5). No significant cleavage of any of these five cytokines was observed with HC. However, hCG efficiently degraded IL-7 and IL-31, with minor cleavage of IL-21 and IL-24, as reflected by the reduced intensity of bands in the hCG lanes (Fig. 1, Gel 5). With regard to the cleavage of IL-17A, IL-17F, IL-22, CD40L, and BAFF, minor cleavage activity by HC on BAFF, as well as by hCG on IL-17A, IL-22, CD40L, and BAFF, was observed. Reduced gel fragment intensity was observed for the latter three (Fig. 1, Gel 6). The effect on IL-17A was primarily by trimming of the N- or C-terminal end. The next set of substrates analyzed included VEGF-A, BMP-7, PDGF-A, PDGF-B, and IL-33. Of these five cytokines, only IL-33 was cleaved by HC, whereas hCG efficiently cleaved VEGF-A and IL-33 and trimmed the N- or C-terminal end of BMP-7 (Fig. 1, Gel 7). Cleavage of IL-33 resulted in its complete degradation by HC and hCG. Cleavage of CTGF, FGF-1, FGF-2, Flt3L, and IL-18 was analyzed. HC efficiently cleaved IL-18 and trimmed Flt3L. A minor effect on CTGF, FGF-1, and FGF-2 was also observed. hCG degraded CTGF, FGF-1, and IL-18 relatively efficiently and showed a minor trimming effect on Flt3L (Fig. 1, Gel 8). The effect of hCG on CTGF is similar to the effect of HC on IL-4. After a potential initial cleavage, the protein appears totally degraded, because no cleavage products were observed; however, the intensity of the full-size cytokine band was markedly reduced (Fig. 1, Gel 8). The ninth and tenth panel of substrates included nine chemokines and EGF (Fig. 1, Gels 9 and 10). 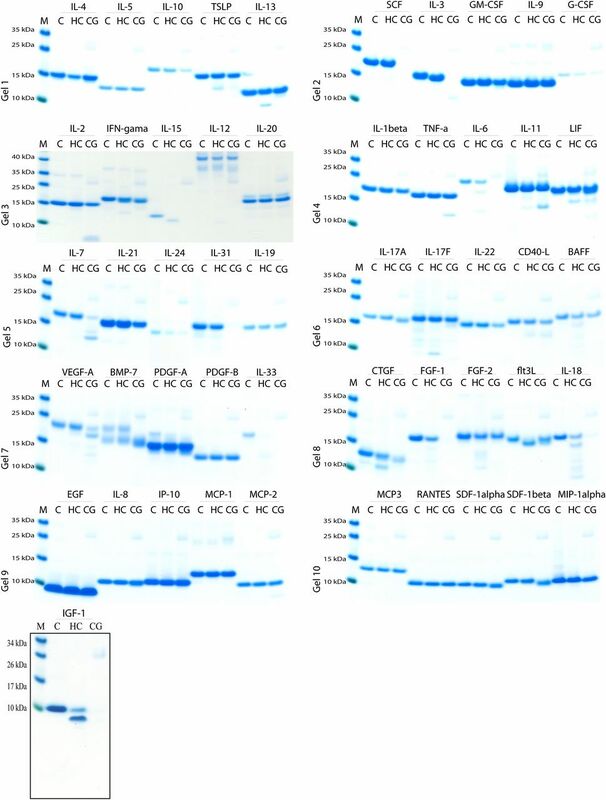 The proteins analyzed were EGF, IL-8, IP-10, MCP-1, MCP-2, MCP-3, RANTES, SDF-α, SDF-β, and MIP-1α. Almost no cleavage was observed by HC or hCG (Fig. 1). The only observed effect was minor N- or C-terminal trimming of SDF-β by hCG. Following our analysis of the above 50 cytokines and chemokines, an article was published showing the cleavage of insulin-like growth factor 1 (IGF-1) by the mouse chymase mMCP-4 (25). Therefore, we decided to examine the potential cleavage of this growth factor by HC and hCG. Human IGF-1 was efficiently cleaved by HC, resulting in one large fragment and probably a second very small fragment that was not visible on the gel, indicating cleavage at a single site. hCG completely degraded this protein, leaving no visible degradation product on the gel (Fig. 1, last panel). Recently, HC was found to preferentially cleave in the linker region between the N-terminal DNA-binding domain and the C-terminal IL-1–related cytokine domain of human IL-33, thereby increasing the cytokine activity 30-fold (19). To analyze the possibility that HC and hCG have dual activities (i.e., both activating and inactivating) on the IL-18 and IL-33 cytokines, we produced both proforms as recombinant soluble cytokines with a 6-His affinity tag in bacteria and purified them on IMAC resin. Cleavage analysis showed that the effect of both enzymes was primarily on IL-18 degradation. In contrast, IL-33 was activated by HC and subsequently degraded upon prolonged cleavage. hCG did not show any activating activity; instead, it caused rapid degradation of full-length and activated IL-33 that resulted in undetectable very small cleavage products (Fig. 2). Analysis of recombinant full-length and activated human IL-18 and IL-33 after cleavage with HC or hCG. Approximately 20 μg of full-length (FL IL-18 His6-tag, and FL IL-33 His6-tag) and active human IL-18 and IL-33 was cleaved with HC or hCG. Samples were removed at 0, 15, 45, and 150 min, inactivated by the addition of sample buffer, and heated for 2 min at 95°C to stop the cleavage reaction. These samples containing ∼4 μg of protein each were separated on 4–12% gradient SDS-PAGE gels, and the gels were stained with colloidal Coomassie blue solution or by silver staining. The amount of enzyme used in the cleavage reaction for four time points + one extra sample is listed above each cleavage reaction including four samples. Almost equimolar amounts of hCG were used during cleavage, which makes the enzyme show up on the gel at the same position as full-length IL-18 and full-length IL-33. HC is larger and appears as a faint band above the full-length cytokines. To study the importance of location and potential accessibility of potential cleavage sites in the cytokines that were cleaved by HC, their three-dimensional (3D) structures were analyzed. IL-18 and IL-33 were two cytokines that were efficiently cleaved; therefore, they were selected as good targets to analyze. In addition, two cytokines that were not cleaved, IL-4 and IL-13, were included as reference structures (Fig. 3). The major potential cleavage sites (marked in yellow), based on the consensus cleavage sites identified by phage display analysis for these two enzymes, were identified in the primary structure of these proteins (Fig. 3) (23, 24) (M. Thorpe, Z. Fu, and L. Hellman, unpublished observations). The sites containing the aromatic amino acids Tyr and Phe in the P1 position are in bold, negatively charged residues in the P2′ positions are in red, and a few additional potential Leu cleavage sites are highlighted in green (Fig. 3). Selected potential sites are shown on the structures of these cytokines depicted just below the sequences (Fig. 3). Some sites are exposed on the surface of the target proteins, highlighting their potential accessibility to the enzymes, whereas some sites are more hidden, which results in inefficient cleavage or even an inability to be cleaved (Fig. 3). Several sites within IL-18 and IL-33 are exposed on the surface and appear to be highly accessible, which supports the notion that they are more easily targeted for cleavage by HC and hCG. However, the sites within IL-4 and IL-13 are mostly hidden, with the exception of the C-terminal site in IL-13 that also is cleaved (nicked) by HC (Fig. 3). A full list of the potential cleavage sites for HC and hCG, as well as the MC tryptases in all proteins included in this study, is shown in Supplemental Fig. 1. An analysis of five potential sites in human IL-6 is included as Supplemental Fig. 2, because IL-6 showed some cleavage by HC and almost complete cleavage by hCG. Of the five potential sites, only one is clearly exposed (Supplemental Fig. 2). Therefore, the majority of potential sites are hidden sites. From Fig. 1, Gel 4, it also appears that HC primarily cleaves at one position, because two relatively large fragments are clearly visible in the HC lane. A summary of the total net charge and the number of potential cleavage sites for HC and hCG is included as Supplemental Table I. Analysis of the potential cleavage sites in the 3D structure of selected cytokines. 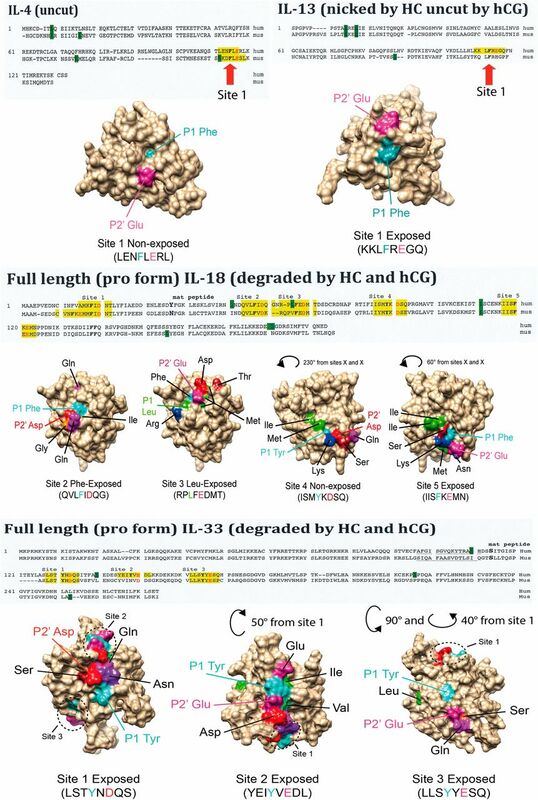 The primary sequences of the cytokines IL-18, IL-33, IL-4, and IL-13 were analyzed for potential cleavage sites for HC and hCG based on the consensus cleavage site obtained from phage display analysis of HC (23). The sites containing the aromatic amino acids Tyr and Phe in the P1 position and negatively charged residues in the P2′ positions are highlighted in yellow; a few additional potential Leu cleavage sites are highlighted in green. Several of the most optimal sites were then analyzed for their positions in the crystal structures of these four cytokines. As depicted, some of these sites are exposed on the surface of the cytokine, whereas others are relatively well hidden and likely are not accessible. To obtain a better understanding of the actual usage of potential cleavage sites in a protein, as indicated from the 3D structures, we performed MALDI-MS analysis of the cleavage products of human full-length IL-18 after cleavage by HC for 2.5 h. IL-18 was selected because it is efficiently cleaved by HC but not fully degraded; therefore, it shows a number of distinct bands that can be identified by MS analysis (Fig. 4). As can be seen from the 3D structures (Fig. 3), nonexposed site 4 was not cleaved by HC as predicted, and exposed sites 1, 2, and 5 were all seen as targets for the enzyme. Interestingly, site 3, where Phe is hidden, is actually preceded by a more exposed Leu residue. In this case, Leu becomes the preferred target, which further strengthens the view that accessibility of the target site is of major importance for actual cleavage, at least when the structure is properly folded and compact. However, a marked change in the situation can occur following initial cleavage, which may result in a more open structure and increased accessibility of previously hidden sites. This may be the case for IL-4 with HC (Fig. 1, Gel 1) and for CTGF with hCG (Fig. 1, Gel 8), where we see a reduction in the intensity of the band but no cleavage products. MS analysis of the potential cleavage sites for HC in recombinant full-length human IL-18. Following digestion of ∼20 μg of full-length human IL-18 with HC for 2.5 h, the sample was submitted for MALDI-MS analysis. The result from this analysis is shown in the center of the figure, with the major product peaks marked with red stars. The two smaller peaks A and B match the sizes of the corresponding sequences of these peptides. The sequences of these two peptides are shown inside the MS-analysis diagram in the center of the figure. The three additional larger fragments do not match the sizes perfectly, which may be a result of lower accuracy in the calibration of the standard curve for larger-sized peptides but corresponded to the best possible matches considering cleavage at aromatic amino acid residues or leucines that, to our knowledge, are the only residues at which HC cleaves. No cleavage is observed at hidden site 4, but cleavage occurs at the exposed and, thereby, accessible sites 1, 2, 3, and 5. All aromatic amino acids in the sequence for full-length human IL-18 are shown in red, whereas all leucines are shown in green. 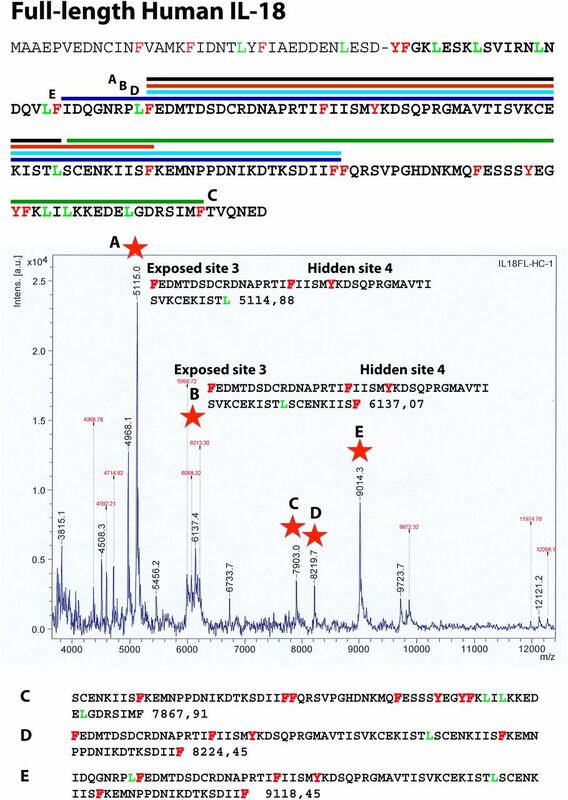 The fragments generated as identified from sequence and fragment size from the MS analysis are marked by colored lines in the sequence in the upper part of the figure. The sequence of the tentative fragments A to E are listed inside the central MS analysis (A and B) or in the lower part of the figure (C, D, and E). A dominating view of the hematopoietic serine proteases has been that they are relatively unspecific and cleave almost any substrate if allowed to do so for extended periods of time; however, this is clearly not true. To obtain a more representative view of the biological activity of two of these enzymes, we analyzed the activities of HC and hCG on a very extensive panel of recombinant human cytokines and chemokines. We used optimal conditions and a relatively high enzyme/substrate ratio to ensure that, if we observed cleavage within 2.5 h, it would serve as a potential in vivo substrate. There are numerous reports showing cleavage under more excessive conditions, which is clearly not relevant when considering the in vivo situation. With this in mind, if you attempt to cleave a substrate in near equimolar concentrations (enzyme to substrate) for 2.5 h and do not see substantial cleavage but observe cleavage after 10 or 20 h, the effect is unlikely to be biologically relevant. In vivo, other proteases and protease inhibitors would most likely inactivate the enzyme within minutes, or at least within a few hours, which further supports why in vitro analysis of cleavage for extended periods is probably not biologically relevant. The results obtained from this study show a remarkable specificity of at least one of these two enzymes, HC. Of the 51 human cytokines, chemokines, and growth factors analyzed, efficient cleavage of only three of these substrates (IL-15, IL-33, and IL-18) was observed (Fig. 1, Table I), despite having one or several potential extended cleavage sites for HC and hCG (Supplemental Fig. 1). Minor cleavage was also seen for TSLP, IL-13, IL-6, BAFF, CTGF, FGF-1, and FGF-2 and an N- or C-terminal trimming of Flt3L. However, the minor cleavage observed under these conditions, which are close to optimal, is most likely of minor biological relevance. This highlights that only a very limited number of targets are potential true in vivo targets for this enzyme. Interestingly, two of the cytokines identified in this screening were the alarmins IL-18 and IL-33. Both of them are IL-1–related cytokines that appear at an early stage of tissue damage or infection. One possible scenario is that HC has an important dampening role by cleavage and inactivation of these two cytokines. When the immune system has been triggered by these two cytokines, one response may be the activation of MCs that degranulate and release chymase, which may act as a negative-feedback loop to limit excessive inflammation. It should be noted that IL-33 and IL-18 do not seem to cause MC degranulation by themselves; however, other alarmins, like HSP70 and HMGB1, may well do this directly or indirectly in vivo (26, 27). The third cytokine identified in this screening was IL-15, which has an important role in regulating NK cell, γδ T cell, and CD44hi memory CD8+ T cell homeostasis (28, 29). Excessive amounts of IL-15 can also result in a strong inflammatory response and autoimmune manifestations (30). In this case, the role of HC may be to regulate T cell and NK cell numbers, thereby limiting more chronic inflammation in which NK cells, γδ T cells, and memory CD8+ T cells are involved. IL-15 also has a role in inhibiting MC-dependent recruitment of neutrophils during sepsis, indicating a dampening role for chymase also in this model (31). Interestingly, none of the nine chemokines analyzed showed any cleavage by HC, which strongly suggests that chemokines are not the prime targets of this enzyme. In our analysis, a much higher number of potential in vivo substrates was observed for hCG than for HC. We observed efficient cleavage of 10, and possibly 11, cytokines; however, similarly to HC, there was no or very minor effect on the different chemokines (Fig. 1). The cytokines SCF, IL-3, IL-15, IL-6, IL-7, IL-31, IL-33, FGF-1, and IL-18 were efficiently cleaved by hCG, whereas CTGF was cleaved less efficiently (Fig. 1). A minor effect was seen for a number of additional cytokines, including IL-2, IL-21, IL-24, IL-17A, IL-40L, and SDF-1β (Fig. 1). However, it should be taken into account that the amount of enzyme used was ∼10 times higher for hCG than for the chymase, which may explain, at least in part, the larger number of potential targets observed. The reason for using the higher concentration was that we and other laboratories observed an ∼10-fold lower overall activity for hCG compared with HC (6). However, this enzyme also has a more broad specificity, including a relatively strong activity on Leu and Lys in the P1 position, thus exhibiting chymase and tryptase activity (6, 7). This broader specificity may be the major reason for the larger number of potential targets. Interestingly, all three cytokines identified as potential targets for HC (IL-18, IL-33 and IL-15) were also potential targets for hCG, indicating a more broad need for their downregulation by MCs and neutrophils. Cleavage of IL-6 may also have an important regulatory function, because it is a key cytokine in the regulation of Th17 cells that, in turn, are potent inducers of an immune response focusing on bacterial defense, including recruitment of neutrophils to the area of infection. When neutrophils enter the tissue and become activated, possibly by bacterial products, they may release hCG, which can diminish the activation and recruitment of Th17 cells and thereby control the activation by a negative-feedback loop. IL-31 is also interesting from a skin perspective. This cytokine was shown to be responsible for the itching that triggers scratching in patients with atopic dermatitis (32). Efficient cleavage and, thereby, downregulation of its activity may be beneficial in skin infections when immune cells have entered the tissue, and scratching worsens the situation. SCF and IL-3 are important cytokines for early myeloid development (33), and IL-7 plays the same role in lymphoid cells (34, 35). The role of neutrophil or MC release of hCG in the regulation of early myeloid and early lymphoid development is more difficult to explain, but it needs to be taken into consideration upon analysis of the effect by enzymes released from mature terminally differentiated immune cells on early hematopoiesis. Recently, HC was found to efficiently activate human IL-33 by cleaving in the region between the DNA-binding N-terminal domains and the C-terminal IL-1–related cytokine domain, thereby releasing the cytokine domain, which results in a 30-fold increase in activity (19). Lefrançais et al. (19) also discussed earlier data showing degradation of this cytokine. They concluded that activation is the prime effect of HC, and degradation is only observed after excessive cleavage. To study this possibility, we produced full-length IL-18 and IL-33 and analyzed cleavage by HC at different enzyme concentrations and times of cleavage. Over time, we observed cleavage of the linker region and a simultaneous degradation of the cytokine domain (Fig. 2). HC and hCG primarily degrade IL-18, both the full-length (proform) and the activated forms (Fig. 2). However, HC, but not hCG, also activates human IL-33. With low levels of the enzyme the active form of IL-33 is formed first, which is followed by its degradation (Fig. 2). In contrast, hCG rapidly degrades full-length and active IL-33 very quickly to very small peptides that are not visible on the gel (Fig. 2). It is interesting that the two enzymes give such different results with regard to the cleavage of this cytokine. When analyzing the literature for what is known about potential targets for human and rodent hematopoietic serine proteases with regards to cytokines and chemokines, we found quite a remarkable difference between species. The major connective tissue MC chymase in mouse, mMCP-4, which is the functional equivalent of HC, was found to efficiently cleave mouse TNF-α (9, 10). However, we observed no cleavage of human TNF-α by HC and only very minor cleavage by hCG (Fig. 1). Another cytokine, IL-13, was shown to be cleaved by mouse MC proteases, but the exact protease(s) responsible for the cleavage has not been identified (36). We observed only very minor cleavage of human IL-13 by HC and no activity on this cytokine by hCG, suggesting that IL-13 is not a major target for either of these enzymes in humans (Fig. 1). Another example is murine IL-6, which is not processed by mMCP-4 under physiological conditions (17); in contrast, HC efficiently cleaved human IL-6 (Fig. 1). These differences may depend on the accessibility of potential extended target sites. Human IL-6 carries three potential extended target sites, whereas mouse IL-6 carries only one, which, in addition, may be structurally hidden for effective cleavage by mMCP-4. Several chemokines, such as chemerin and eotaxin, also were identified as potential targets for these enzymes (14, 15). However, we saw absolutely no activity by HC on any of the nine chemokines analyzed in this study and only minor N- or C-terminal trimming by hCG of one of them (SDF-1β) (Fig. 1). Of the noncytokine chemokine targets identified for these enzymes, some are relatively well conserved, whereas others are cleaved only in primates (e.g., cleavage of secretory leukocyte protease inhibitor, which is cleaved by HC and macaque chymase but not by dog chymase) (37). In contrast, fibronectin and angiotensin I seem to be common targets for the chymases of many mammals (37). Recently, it also was shown that mMCP-4 degrades IGF-1, leading to adverse effects in cardiac remodeling after infarction (25). In this study, we showed that HC and hCG cleave human IGF-1 (Fig. 1). HC most likely cuts off the N-terminal region, because one site matching the HC consensus cleavable sequence is located in the N terminus of the protein (Supplemental Fig. 1), whereas hCG degrades this target completely, leaving no traceable fragments on the gel (Fig. 1). However, more systematic analyses of the evolutionary pattern in target specificity have not performed; such studies might provide a much better picture of which substrates are the prime targets for these enzymes. Another important aspect to consider is the presence of several related and unrelated proteases in the granules of MCs and neutrophils. The proteases stored in these granules are released together, which could alter the effect on potential target molecules. The initial cleavage by one enzyme could open the structure and make the target more sensitive to proteolysis by other enzymes. The enzymes within the granules of immune cells have quite different primary and extended specificities, including chymase, tryptase, elastase, aspase, and carboxypeptidase activities (1–4). To fully understand the sensitivity of these potential target molecules to degradation by MC and/or neutrophil proteases, a study of the combined effect should be done under physiological conditions. A structural analysis aimed at identifying the potential sites in IL-18, IL-33, and IL-15, as well as why potential sites in other cytokines and chemokines are not cleaved, gave interesting results (Figs. 2, 3). The sites in IL-18 and IL-33 that match or are close to the consensus sequence for HC recently identified by our laboratory are exposed on the surface of the cytokine in a region that appears to be highly accessible to the enzyme (23). In contrast, the potential sites in a few of the noncleaved cytokines (IL-4 and IL-13) are generally hidden (Fig. 3). To determine whether these predictions were accurate, experimental verification was carried out by analyzing the fragments, using MALDI-MS, generated after cleavage of full-length human IL-18 by HC. This analysis confirmed several of the predictions made from the structural analysis. Site 4, which is hidden in the structure, was not cleaved to a significant extent, and at least three exposed sites were found to be cleaved by HC (Fig. 4). Interestingly, for site 3, where the aromatic amino acid is hidden, the preceding Leu is cleaved instead. This clearly indicates the importance of accessibility for efficient cleavage (Fig. 4). This Leu is also better positioned, concerning the negatively charged residue in the P2′ position, than the more hidden Phe (Fig. 4). In summary, our analysis of this broad panel of 50 human cytokines and chemokines for their sensitivity to cleavage by HC and hCG shows a remarkable restrictive cleavage by HC and a slightly broader range for hCG. Only 3 of 50 were efficiently cleaved by HC, and 10 or 11 were cleaved by hCG. Interestingly, both cleaved the alarmins IL-18 and IL-33, as well as IL-15, which is of major importance for T cell homeostasis. Growing evidence supports a close interaction between MCs and T cells in inflammatory diseases (38). As shown in this article and in other studies, HC and hCG can selectively cleave cytokines related to T cell activities. This adds to the evidence that these two proteases may play a role in the homeostatic imbalances that mediate the pathophysiological symptoms in rheumatoid arthritis and other inflammatory diseases. hCG also efficiently cleaved IL-6, which is an early inflammatory cytokine. IL-6 was also cleaved by HC but to a much lesser extent. Collectively, data about the cleavage patterns for the various cytokines and chemokines for both enzymes suggest that they play an important role in diminishing the effect of early inflammatory cytokines and, thereby, have a prominent role in controlling excessive inflammation. This is an interesting potential function of these proteases that needs to be addressed experimentally. However, this involves several major hurdles: the mouse counterpart to HC, mMCP-4, is not the only chymase of mouse MCs, and the cleavage of several cytokines and chemokines used in this study differ between the two species, making mice less desirable models in which to study the role of HC in human immune biology. Macaques may be an interesting animal model, although they are substantially more expensive and have associated ethical concerns; however, a primate model is most likely needed to resolve these questions. We recently analyzed the macaque chymase and showed that its specificity is almost identical to that of HC. In addition, macaques have only one chymase in their chymase locus. For these reasons, with the exception of the ethical concerns, macaques seem to be an excellent animal model to study the biology of HC (37). In addition and interestingly, the almost complete absence of cleavage of any of the chemokines analyzed in this study indicates that these two enzymes have no or a lesser role in controlling chemokine activity in vivo. This work was supported by Swedish National Research Council Grants 621-2011-5007 (to L.H.) and 521-2011-3533 (to M.Å.).
. 2008. Neutrophil elastase, proteinase 3 and cathepsin G: physicochemical properties, activity and physiopathological functions. Biochimie 90: 227–242.
. 2010. Mast cell proteases: multifaceted regulators of inflammatory disease. Blood 115: 4981–4990. 2011. Mast cell proteases as protective and inflammatory mediators. Adv. Exp. Med. Biol. 716: 212–234.
. 2014. Granule proteases of hematopoietic cells, a family of versatile inflammatory mediators - an update on their cleavage specificity, in vivo substrates, and evolution. Biol. Chem. 395: 15–49.
. 1987. Quantitation of histamine, tryptase, and chymase in dispersed human T and TC mast cells. J. Immunol. 138: 2611–2615.
. 2010. How immune peptidases change specificity: cathepsin G gained tryptic function but lost efficiency during primate evolution. J. Immunol. 185: 5360–5368.
. 2011. Discriminating between the activities of human cathepsin G and chymase using fluorogenic substrates. FEBS J. 278: 2635–2646.
. 2016. Mast cells and IgE in defense against venoms: possible “good side” of allergy? Allergol. Int. 65: 3–15.
. 2012. The chymase mouse mast cell protease 4 degrades TNF, limits inflammation, and promotes survival in a model of sepsis. Am. J. Pathol. 181: 875–886.
. 2008. The extended cleavage specificity of the rodent beta-chymases rMCP-1 and mMCP-4 reveal major functional similarities to the human mast cell chymase. Mol. Immunol. 45: 766–775.
. 1991. Rapid and specific conversion of precursor interleukin 1 beta (IL-1 beta) to an active IL-1 species by human mast cell chymase. J. Exp. Med. 174: 821–825.
. 2006. Human mast cell chymase cleaves pro-IL-18 and generates a novel and biologically active IL-18 fragment. J. Immunol. 177: 8315–8319.
. 1997. Chymase cleavage of stem cell factor yields a bioactive, soluble product. Proc. Natl. Acad. Sci. USA 94: 9017–9021.
. 2008. Role of neutrophil proteinase 3 and mast cell chymase in chemerin proteolytic regulation. J. Leukoc. Biol. 84: 1530–1538.
. 2015. Eotaxin-3 (CCL26) exerts innate host defense activities that are modulated by mast cell proteases. Allergy 70: 161–170.
. 2013. Mast cell chymase modulates IL-33 levels and controls allergic sensitization in dust-mite induced airway inflammation. Mucosal Immunol. 6: 911–920.
. 2014. Mast cell chymase degrades the alarmins heat shock protein 70, biglycan, HMGB1, and interleukin-33 (IL-33) and limits danger-induced inflammation. J. Biol. Chem. 289: 237–250.
. 2006. Mast cell beta-tryptase selectively cleaves eotaxin and RANTES and abrogates their eosinophil chemotactic activities. J. Immunol. 176: 3788–3795.
. 2014. Central domain of IL-33 is cleaved by mast cell proteases for potent activation of group-2 innate lymphoid cells. Proc. Natl. Acad. Sci. USA 111: 15502–15507.
. 2010. Potency variation of small-molecule chymase inhibitors across species. Biochem. Pharmacol. 80: 1033–1041.
. 1988. Improved staining of proteins in polyacrylamide gels including isoelectric focusing gels with clear background at nanogram sensitivity using Coomassie brilliant blue G-250 and R-250. Electrophoresis 9: 255–262.
. 1967. On the size of the active site in proteases. I. Papain. Biochem. Biophys. Res. Commun. 27: 157–162.
. 2009. The extended substrate specificity of the human mast cell chymase reveals a serine protease with well-defined substrate recognition profile. Int. Immunol. 21: 95–104.
. 2010. Arg143 and Lys192 of the human mast cell chymase mediate the preference for acidic amino acids in position P2′ of substrates. FEBS J. 277: 2255–2267.
. 2016. IGF-1 degradation by mouse mast cell protease 4 promotes cell death and adverse cardiac remodeling days after a myocardial infarction. Proc. Natl. Acad. Sci. USA 113: 6949–6954.
. 2013. Spreading depression triggers headache by activating neuronal Panx1 channels. Science 339: 1092–1095. 2013. The biology of IL-15: implications for cancer therapy and the treatment of autoimmune disorders. J. Investig. Dermatol. Symp. Proc. 16: S28–S30. 2015. The shared and contrasting roles of IL2 and IL15 in the life and death of normal and neoplastic lymphocytes: implications for cancer therapy. Cancer Immunol. Res. 3: 219–227.
. 2015. Interleukin-15, a master piece in the immunological jigsaw of celiac disease. Dig. Dis. 33: 122–130. 2012. The role of interleukin-15 in inflammation and immune responses to infection: implications for its therapeutic use. Microbes infect. 14: 247–261.
. 2016. Mediators of chronic pruritus in atopic dermatitis: getting the itch out? Clin. Rev. Allergy Immunol. 51: 263–292.
. 2008. Haematopoietic growth factors and their therapeutic use. Thromb. Haemost. 99: 863–873.
. 1994. Early lymphocyte expansion is severely impaired in interleukin 7 receptor-deficient mice. J. Exp. Med. 180: 1955–1960.
. 2012. Mast cells limit extracellular levels of IL-13 via a serglycin proteoglycan-serine protease axis. Biol. Chem. 393: 1555–1567.
. 2012. Extended cleavage specificity of the mast cell chymase from the crab-eating macaque (Macaca fascicularis): an interesting animal model for the analysis of the function of the human mast cell chymase. Int. Immunol. 24: 771–782.
. 2015. Mast cells as regulators of T cell responses. Front. Immunol. 6: 394.